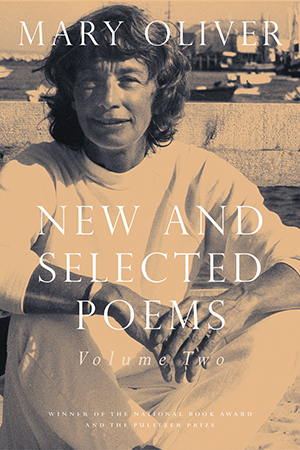 New and Selected Poems, Volume Two, an anthology of forty-two new poems-an entire volume in itself-and sixty-nine poems hand-picked by Mary Oliver from six of her last eight books, is a major addition to a career in poetry that has spanned nearly five decades. Now recognized as an unparalleled poet of the natural world, Mary Oliver writes with unmatched dexterity and a profound appreciation for the divergence and convergence of all living things. Mary Oliver is always searching for the soul of things. In poem after poem, her investigations go from the humble green bean that nourishes her and makes her wonder if "something/-I can't name it-watches as I walk the/rows, accepting the gift of their lives/to assist mine" to the vast, untouchable bliss of "things you can't reach./But you can reach out to them, and all day long./The wind, the bird flying away./The idea of God." Oliver's search grows and is informed by experience, meditation, perception, and discernment. And all the while, during her quest, she is constantly surprised and fortified by joy. This graceful volume, designed to be paired with New and Selected Poems, Volume One, includes new poems on birds, toads, flowers, insects, bodies of water, and the extraordinary experience of the everyday in our lives. In the words of Alicia Ostriker,'Mary Oliver moves by instinct, faith, and determination. She is among our finest poets, and still growing.' In both the older and new poems, Mary Oliver is a poet at the height of her control of image and language. "Far beneath the surface-flash of linguistic effect, Mary Oliver works her quiet and mysterious spell. It is a true spell, unlike any other poet's, the enchantment of the true maker." "Oliver's often quiet persona almost always rides a storm of discovery . . . She continues to earn applause and admiration for continuing to provide redemptive mediation and supple praises for nature in a time when so much is under threat." "These are life enhancing and redemptive poems that coax the sublime from the subliminal." "Oliver's poems are thoroughly convincing-as genuine, moving, and implausible as the first caressing breeze of spring." "The gift of Oliver's poetry is that she communicates the beauty she finds in the world and makes it unforgettable." "It has always seemed, across her 15 books of poetry, five of prose and several essays and chapbooks, that Mary Oliver might leave us any minute. Even a 1984 Pulitzer Prize couldn't pin her to the ground. She'd change quietly into a heron or a bear and fly or walk off forever. Her poems contain windows, doors, transformations, hints on how to escape the body; there's the 'glamour of death' and the 'life after the earth-life'…The new poems teem with creation: ravens, bees, hawks, box turtles, bears. The landscape is Thoreauvian: ponds, marsh, grass and cattails; New England's "salt brightness"; and fields in "pale twilight." The poems from Why I Wake Early (2004) are, in contrast, full of white things and "untrimmable light"; from Owls and Other Fantasies (2003), of watery sounds, singing, rain; from West Wind (1997), of starry distances and traveling. A reader sees the outlines of autobiography. Isn't that what an author intends, in choosing, if not favorites, at least signposts in selected work?" "This poet contemplates the natural world with deep and soulful attention, and then, with simple words sparely arranged, verbalizes the relationship between Earth and the human spirit. She provides the modern voice of the spirituality inherent in consideration of Nature." "As regular readers of our book reviews already know, we can't get enough of the exquisite poetry of Mary Oliver. She tutors us in the art of long-looking, opens our eyes to the wonders and mysteries that abound in the natural world, and relishes animals and all the enchantments that come with being in their presence. There is a devotional quality to her poems that brings a hush to our minds and demands silent attention. The words mesmerize us and suddenly we find ourselves bewitched by the delicious joy and delight of her poetry." "In Oliver's latest collection, fluttering petals are little fires, blue herons are the poems Oliver wishes to write, and Percy, her dog, hungrily consumes the Bhagavad Gita and extracts Donald Rumsfeld from the armpit of the president in order to inspire more rational behavior. Mary Oliver wants to break our hearts, or, as she says, to open them up so that they will never again close to the world. I doubt that my heart has ever been more lovingly broken."